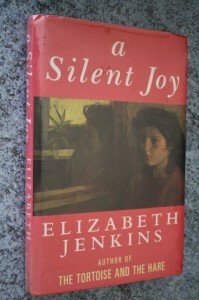 A Silent Joy was Elizabeth Jenkins’ final novel, published in 1992, more than sixty years after her first. And it is an accomplished study of love and relationships in many forms, set in 1950s London. First there was Sir Geoffrey Galbraith, a successful barrister and a recent widower. His marriage had been happy, and he and his wife had been content with their home, their garden, good friends. A quiet life. But he knew that he had to accept that his wife was gone, and that he had to carry on alone. Fred Talbot, Sir Geoffrey’s driver, was in a rather less comfortable position. His socially ambitious wife, after years of belittling her easy-going husband, had run away with another man. He wasn’t sorry to see her go, but he felt humiliated and he struggled to cope at home. Sir Geoffrey saw the situation and, tactfully so as not to hurt his driver’s pride, he offered help. A building in his grounds could easily be converted into living accommodation. It seemed eminently sensible to Fred: a new start and a simpler life. Some time later Sir Geoffrey would take someone else into his home. He was concerned when he found young Irina Stenning walking the streets alone after dark, and even more concerned that her family hadn’t noticed she was gone. He knew them, as friends of friends, and so he took Irina home and Mrs Treadgold agreed that she should stay for a while. Marcia, Irina’s mother, was not a happy woman. Her sensible, successful husband bored her. Motherhood didn’t fulfill her. And so she drifted into an affair with disreputable businessman Ivor Mossop. Irina didn’t like him; she wanted to stay with her father. Jasper Spedding was a good man, a successful man, who did his best for his wife and children. He couldn’t understand what his wife wanted, and she couldn’t explain what he was doing wrong. She said that the very fact that he asked was wrong. Meanwhile his elder daughter, had fallen in love, accepted a proposal of marriage, and was happily planning her wedding and her future. She was fond of her little sister, but she didn’t have much time for her. Jasper was killed in an accident. Marcia was infuriated that he had changed his will, leaving her provided for but not wealthy, leaving money for his daughters in trusts to be managed by his solicitor until they came of age. but at least it meant that she could marry Ivor. And so it was quite easy for Irina to wander off, and for nobody to notice. That’s far from the end. I don’t want to say to much, but it’s hard not to, because the joy of this book is the way the characters, their relationships are set out. They are so carefully and clearly observed, and they become clearer as events unfolded. Elizabeth Jenkins created a very real world and she filled it with real, fallible, utterly believable human beings. She stood back, maintaining a respectful distance but she saw and understood everything, and that pulled me in. There were moments when I wondered if she was being rather harder on the women in her story than the men, but as the story moved forward I found I could accept that she presented all of her characters fairly and honestly. The were all what their natures, their lives, their circumstances, had made them. It was lovely to spend time in Sir Geoffrey’s house. Such intelligent thoughtful and compassionate men are rare. When Fred’s wife decided to come back, when he didn’t want her back but she carried on regardless, he sorted things out for both of them with gentle charm and diplomacy. He managed Mrs Karomotis beautifully too. She had been a widow, eccentric, adrift and desperately in need of a role and she had found that role in Martha’s household. She was a loyal friend, and she supported Monica without question, never doubting the rightness of her decisions. But Sir Geoffrey did ask questions, and he made her think. I was less happy in the Spedding household. Marcia was horrible selfish, quite oblivious to the feelings of others. She may have been troubled she may have been in love with Ivor, but I could not forgive her for her lack of interest her elder daughter’s plans or her complete disregard for her younger daughter. And so there was light and shade in a story, that was quite beautifully wrought. I was just a little sorry that all of the romantic relationships were beginning or ending or in the past. Maybe that said something about the life the author had. I suspect it did, and I saw signs that she was disappointed in some of the ways the world had changed in her lifetime. But she understood romantic love, family love, friendship, comradeship … and their importance. And that is why I can say, even though this is not her finest work, it is still a very fine novel. I loved The Tortoise and the Hare so much (and her biography of Jane Austen) that I’d like to read anything else she has written. Another new author to discover! It’s a rare thing to find anything by Jenkins on the shelves here whether in a library or shop so lucky you and thanks for sharing. I bought a copy of Harriet last month and am really looking forward to it…it’s just not really the sort of thing you want to read during a happy season. Like Audrey, I love The Tortoise and the Hare fiercely and am so eager to read more of Jenkins’s work. It is a shame that most of her novels are really hard to find or hugely expensive. I did just recently find a copy of ‘Brightness’ for an affordable price so am very happy about that. I hope I can find ‘A Silent Joy’ someday.